Now, the Clog wouldn’t call ourselves redditors – we’re too afraid of being sucked into a deep dark corner of the internet (although not as dark as 4chan), but today we ventured on to the popular site to be greeted by a dear friend. Oski. Why was our mascot reppin’ reddit Monday, April 16? Apparently Berkeley won third place in a “Grow a College Subreddit Competition,” so all the world had their interwebs invated by the Golden Bears (or in this case, bear). The 6 other colleges in the top seven will also get their moment in the light, but we don’t think their mascots will be as cute as ours. 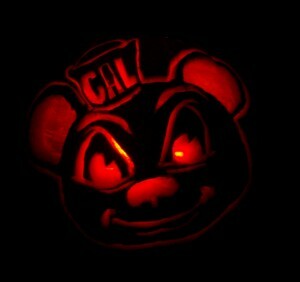 Can whoever designed this Oski redesign the creepy monster that adorns Cal gear nowadays? Seriously, we have nightmares. Enjoy the next 45 minutes of Berkeley’s occupation of reddit. As all of you should know, something very important is happening this week. 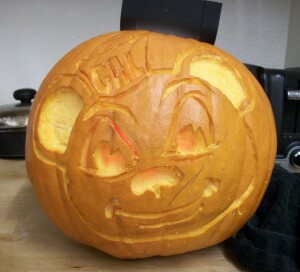 No, not that, you silly, the big Cal vs. Stanford game! Now, plenty of things have been happening around campus in preparation for this epic game. Pretty lights, protests, bonfire rallies and the works! But in spite of all these elements in typical school rivalries, what is always a constant? That’s right, mascots! So, remember back a few weeks ago when we invited you all to send us pictures of your best Halloween decorations and pumpkin masterpieces? Well, we did. We also picked out a few of our favorites, and thought you might like to see ’em, too. This pumpkin (pictured, right), carved by freshman Amanda Burke, caught our attention pretty quickly (we’re sure you can see why). The artist gets mad props for venturing away from tradition and letting school spirit cover that orange canvas. We couldn’t help but be impressed by Burke’s technique: Oski’s face is partially carved and partially shaved, creating a variety of really cool glow effects when placed in its natural habitat — the dark! 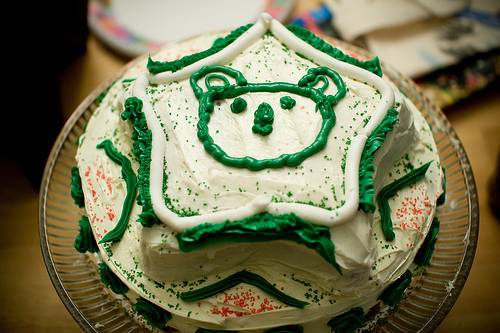 Happy Birthday to … Oski? Yep, it’s that special time of year that’s like every other special time of year—Homecoming is back! (Though we could have gone with midterm season.) 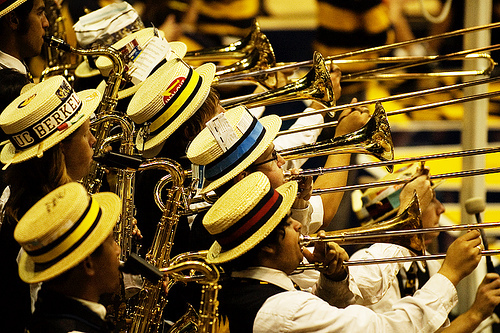 Berkeley has a Homecoming you can take pride in: Unlike other campus festivities like Caltopia, you can get lots of free things during Homecoming. As promised, here’s the grizzly footage of Stanfurd’s tree against dear Oski. We love the commentating for this video, but most of all, we love that even as Oski’s escorted out, he still struts his signature walk. And here’s another thought: Anyone see an allegory here? 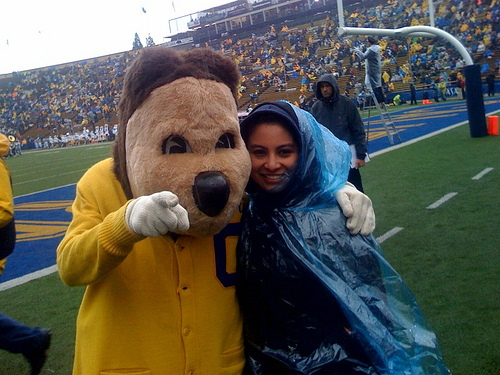 If Oski can beat up the Stanfurd tree, how does that bode for, say, a grove of oaks against a group of Golden Bears? We think we already know the answer to that. It looks like the guys at SPiN on Sports, a subdivision of SportsLine.com, have been a little bored as of late. Inspired by the Discovery Chanel’s Planet Earth series, the guys at SPiN have created a March Madness-esque tournament to see who (or what) is the most dominant mascot of all-time! And of course Cal is in the field of 64 animals/inanimate objects/things/people. Why Oski is in the “Predator Region,” we really don’t know. We mean, look at him. He doesn’t look like he can eat anyone (or anything for that matter). We do know that all he’s good for is chopping down some trees. Speaking of trees, the Stanfurd Cardinal is the No. 14 seed in the “Inanimates/Mythological Creatures Region.” So which category do you think “Cardinal” fits under? Inanimate or Mythological? We’d go for the mythological, since a prancing tree seems pretty mythic. Notably, the Small Dickless Bears, aka, fUCLA, didn’t get into the tournament. Why? We’re guessing they were too busy being small and dickless. Voting for the first rounds continues through April 27th, when SPiN will be announcing the quarterfinal matchups. It should be an easy win for Cal. We mean, it’s Iowa and it’s a hawk. Don’t Bears eat Hawks?